Sessions will sell out in advance, you are advised to pre-book to avoid disappointment. Best availability week day sessions after 12:30pm. $75.00* Plus transaction fee. GST is included in the price of the tickect. Go to the front of the queue with a premium access pass which gives you VIP entry. Dated but untimed it allows you to go in to any session of the day of your choice. 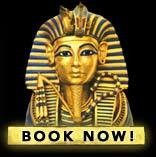 Click here for more info on the VIP Tutankhamun Gold Card.